Some Video game place their affects forever like Organization 13. The Organization 13 Coat has been worn by the main character of the Video game. It was a fictional film which has got attention of the viewers. The stunning black shade of the Organization 13 Coat makes your fabulous and you get special appreciation of the people surrounding you. The synthetic leather or genuine leather is used for the preparation of the coat. The quality of synthetic leather or real leather is unquestionable. The Kingdom Hearts Hoodie has front zipper closure. A custom beaded necklace is present on the Kingdom Hearts Hoodie that has given it winsome look. The hoodie is attached with the jacket. The size is long whereas t cuffs have open hems. 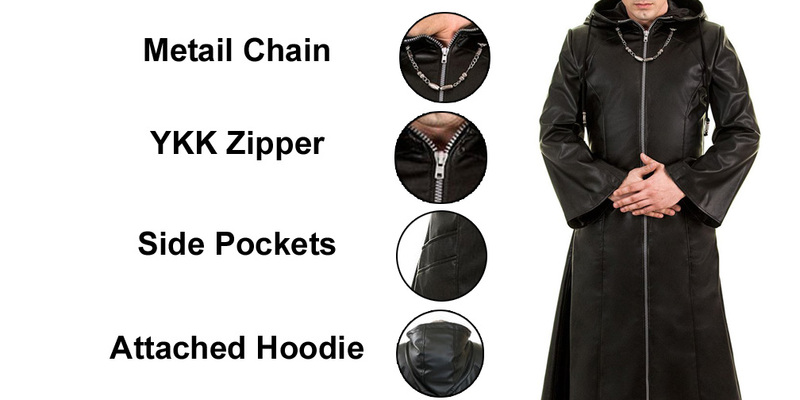 Two side pockets and one inner pocket are added in Organization XIII Coat. The extra detail stitching is forever.